Design by Humans: Save 14% off the Valentine's Day Collection! - Blog @ That Awesome Shirt! 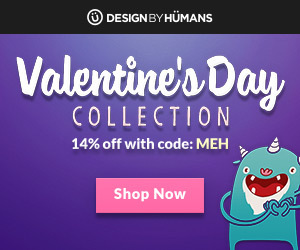 Design by Humans: Save 14% off the Valentine's Day Collection! From now until 2/14/2016, save 14% on all items in the Valentine's Day Collection. When we say all items we mean any of our product types available in the collection (apparel, phone cases, stickers, art prints, etc.). Direct link to Valentine's Day Collection. Expires 14th of February, 2016.